Just having some fun on Sidewinder! Start of the trails below Mt Proctor! Moved to Fernie, cant wait to actually take bike photos again, its been over a year! What a view from the power line! Tuck No hander back flip! First ride of the year, nothing fancy photography wise, just out for a ride after work! My new 2010 Specialized Tarmac Expert! 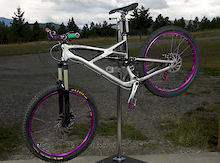 I will be in the Ride To conquer cancer next year and this is the bike I will be riding! Photos for Buy and Sell Article.